Art Taylor, proud Searcher owner/operator for over 30 years. Experience does make the difference! Art Taylor and Celia Condit have owned and operated Searcher Sportfishing out of San Diego, California for over 30 years. Captain Art Taylor and Searcher bring you to the fish. Art started his fishing career in junior high school, working aboard half-day boats in exchange for fishing time. He got serious about fishing as a career and after a short stint in commercial fishing, earned his skipper’s license at the age of 19 and was captain of his first fishing trips at the age of 20. Throughout this time, Art was working under captains such as Bill Poole, Frank LoPreste, Bob Fletcher and others. 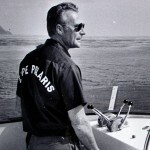 He joined the crew of boats including Cat Special, Champ, Royal Polaris, and Chief as deckhand, second captain and master. The thrill of sportfishing, the reward of teaching anglers to fish better, and the pride in keeping a boat operating smoothly from the engine room to the galley has turned Art into a well-rounded boat operator and business owner. The boat that was to become Searcher was built in 1970 by San Diego’s sportfishing pioneers Bill and Ingrid Poole. After a 15-month construction, she was launched on May 24, 1970 in Newport Beach, California as “the largest sportfisher on the West Coast.” She was named the Cape Polaris and was the first “long-range” sportfisher–the first in a line of famed Polaris boats built by Poole Boats. Her name was changed to Searcher in 1975. Cape Polaris was the first “long-range” sportfisher–the first in a line of famed Polaris boats built by Poole Boats. Art Taylor started operating Searcher in 1982. Since then, it has run overnight, short-range and long-range fishing trips out of Fisherman’s Landing in San Diego. In 1985, Art finalized purchase of Searcher and has become only the the third owner in the boat’s history. With over 30 years’ experience fishing offshore San Diego and at Baja California’s islands and coastline, Captain Art Taylor will bring you to the fish. He knows the hot spots at Alijos Rocks, San Benito and Cedros Islands, and all the famous spots in between. Join Captain Taylor aboard Searcher on a 1.5 day offshore chasing tuna or a 7-day trip to Alijos Rocks where there’s a chance to reel in a 100-pound yellowfin tuna or a feisty wahoo. Or maybe a 3- to 5-day trip fishing for bluefin tuna and yellowtail fits your schedule better. Click for current San Diego Sportfishing Schedule. Our professional crew ensures your fishing experience is fun, safe, and productive. Deckhands are there to offer tackle tips, help you at the rail, and maximize your catch. Cooks prepare fresh and delicious meals and snacks that keep you satisfied. Whether you’re a novice or an experienced angler, come catch some adventure with Searcher Sportfishing! For 35 years Art Taylor has maintained the highest standards for a fishing platform aboard Searcher--from vessel and passenger safety to top-quality crew service. He fishes the hot spots from Baja California to southern California and looks forward to taking you there! Anglers feel right at home with Geri Sue's cooking and friendly personality! Kenny and Art grew up in the San Diego sportfishing business together, and progressed from pinheads to captains. Kenny is a dedicated member of Team Searcher and an angler favorite for his expertise and friendly attitude. Dan has a wealth of experience from decades working on the water. He earned his Captain's license so he's a versatile player on Team Searcher -- from wheelhouse to galley. Shawn has fished from southeast Alaska to Puerto Vallarta and all the hot spots in between during his 30-year career as sportfishing captain and owner!